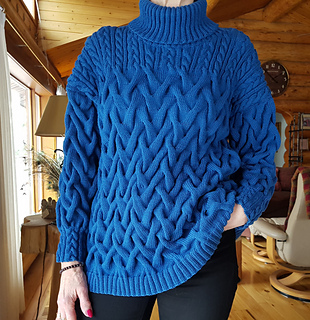 Oversize sweater featuring two styles of cabling. Long version shown here, but pattern variation for cropped version is also provided. 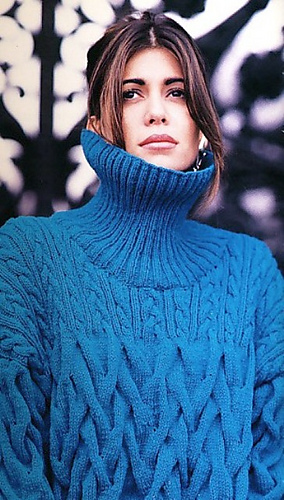 This sweater is featured in 2 versions in the books: longer length and cropped version. The cropped version calls for “Patricia Roberts Cotton No. 2” yarn. 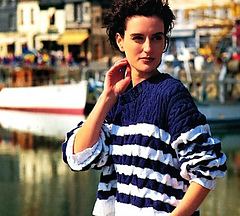 The longer version knitted in wool yarn requires 17 50 gr. balls of “Patricia Roberts Geelong Lambswool No. 2” or 23 50 gr. balls of “Patricia Roberts Pure Wool No. 2”.